Father's Day is just around the dogleg and poor old Dad is waiting with heightened anticipation for this year's latest and greatest golf gift. If he's the only golfer in the family, each (and every) Father's Day he's subjected to the reception of a myriad of unusual golf gifts from members of his loving family. Of course, their intention is good. They want their golfer to have the latest in low-tech gadgets designed not necessarily to improve his game but to enhance his experience on the golf course. You know the sort we're talking about here: the golf towel with a trite golf adage upon it or the pocket electronic gadget to help him keep track of fairways hit, putts and GIR. These and their golf gift cousins are all admirable, but inevitably repetitive. So let's suggest a few ideas that might actually help Dad's game, a gift or two that will raise his confidence level just a touch when he next tees it up. The number one gift on our list that will help Dad with his game is a swing weight. That's right, a simple device that adds weight to the club. The best deal on the market right now is the I Gotcha Ready. It's a combination of swing weight, tempo trainer and release helper. The I Gotcha Ready simply snaps onto you shaft in one of three different positions to give you the desired swing training. It's simple to use and really does work most effectively. It'll probably cost you about $25. If that's not in the budget then go for the time-tested weighted donut for about $4. It'll do the trick to help Dad loosen up before his round. Number two: a good book. You can go in two different directions when selecting a book: either go for an instructional book or choose a volume that is educational and entertaining. With an instructional book keep it simple. Choose nothing with a lot of technical or mechanical jargon. A couple of favorites are the now classic Little Red Book by Harvey Penick with Bud Shrake. Teach Yourself Visually Golf by Anderson, Crowell and Mackin is also an excellent choice. It covers all aspects of the game and is well illustrated. Number three: Regrip his clubs. Now realize here that you don't have to kidnap his clubs from the trunk of the car and bring them to the golf course where they originally began their journey. Simply make arrangements with his favorite golf shop or golf retail store for a gift certificate. 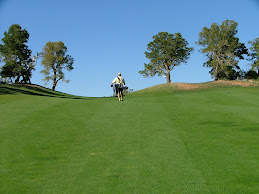 Or if he likes to tinker with his golf clubs, purchase a gift certificate from an online retailer such as The GolfWorks.